If you work in the construction, manufacturing, or woodworks industries, then it is likely you use a lot of hand tools and power tools and may have heard of DeWalt products. This reputable brand is actually a tradename of Black and Decker and is well known for providing tough quality tools for workmen. So you can imagine how excited we were to learn that DeWalt had added some coolers to their lineup of products. To be sure, this isn’t the first time we’ve reviewed coolers that were produced by a manufacturer known for making things in a different industry to the coolers industry. We’ve covered coolers from Caterpillar and Stanley before, and we absolutely loved them. They made us realize that even a company that does not necessarily produce coolers can produce a cooler that is worth every dollar of its price. 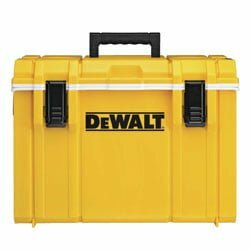 Our expectations were set very high when we went into this DeWalt cooler review, given what we had encountered with Caterpillar and Stanley. Fortunately, DeWalt did not disappoint. Their coolers turned out to be pretty good, especially the rotomolded one. 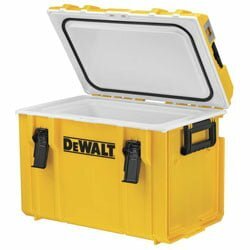 DeWalt released two types of coolers: there is the Toughsystem compatible one, which isn’t rotomolded, and then there is DeWalt’s line of rotomolded ice chests. We’re going to take a look at both of them. 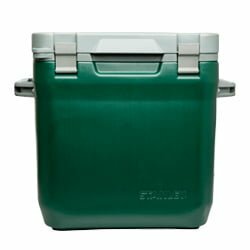 The most glaring aspect of the design of this cooler is that it is not rotomolded. Normally, that would immediately discredit a cooler in our eyes, and we would decide that we weren’t interested. However, for this cooler, like many of the other non-rotomolded coolers we have reviewed out there, there are lots of other features that we thought were so good that they more than made up for the fact the cooler wasn’t rotomolded. That said, there are certain limitations that you should expect to come with a cooler that is not rotomolded. It won’t retain ice for as long as you would expect if it were rotomolded and it probably won’t survive a drop test. 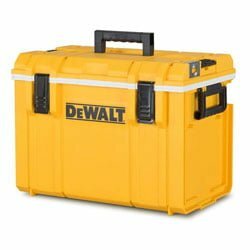 While DeWalt has done everything they could to make this cooler super tough, there are limits even they couldn’t cross, simply because the cooler is not rotomolded. Now that that’s out of the way let’s look at some of the other aspects of its design and construction. To be sure, the plastic on this cooler is pretty tough and still better than most non-rotomolded coolers out there. The handles are firm, and the lid is strong with strong hinges and a premium grade gasket underneath. To give you an idea of just how strong this cooler is, it has a load capacity of 88 lbs, which means it can take on some pretty heavy loads. 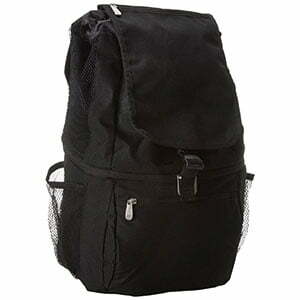 It also has a great capacity of 27 quarts, which is more than enough for the average workman’s needs. 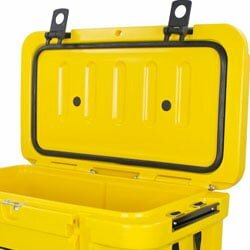 Yes, this cooler has been made for the workman that goes to work in tough conditions, such as the ones found at a construction site or a manufacturing plant. It is built to withstand conditions that would easily dent, scratch, and ding another cooler. With a DeWalt, you don’t have to worry about any of that. In particular, when it comes to wet or dusty environments, the DeWalt Toughsystem compatible cooler is IP65 approved for resistance to both dust and water. This cooler is a beast, pretty much, and has been specifically designed to withstand the kind of industrial environments that simply chew up other coolers. Another feature that we absolutely love with this cooler is the fact that it’s Toughsystem compatible. Toughsystem is a racking and carrier system that allows you to store toolboxes and coolers safely and stably when they are in transit. 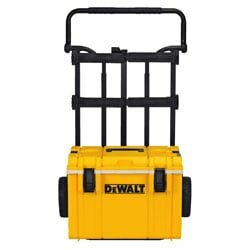 This DeWalt cooler easily connects to a Toughsystem racking system via handles at its sides and therefore it’s a fit with many other Toughsystem-compatible products. As for the internals, it has thick polyurethane foam that ensures good ice retention, even by non-rotomolded standards. We particularly loved that as well. The first feature has to be the strong locks on the lids. They are designed to lock like T-Rex locks, using the same mechanism. 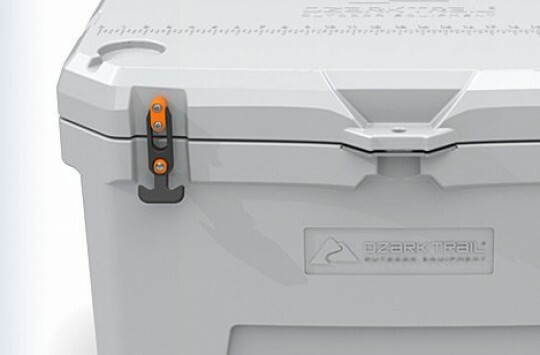 However, they do not look like T-Rex locks and have a more compact design that ensures they hold fast to the body of the cooler. The hinges on the back have a similar design and are also pretty strong, ensuring the lid and the cooler are going to have a long life. On the sides and at the top are plastic handles with strong rubber grips. 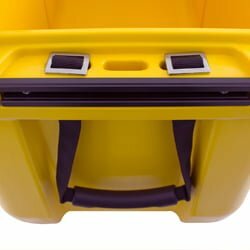 The side handles are for carrying the cooler when it has an especially heavy load while the center handle is for heavier loads. We felt that the side handles would have been better if they weren’t just rigid plastic but nylon rope instead. They’d have been much more comfortable and also stronger. This cooler also comes with a bottle opener integrated into the lid and also 2 can holders in the lid. That way you can carry your morning coffee on the lid so you can drink your coffee on the job or even just carry some cans of hot beverages that you would rather not have cooled. One particularly queer thing we discovered about this cooler that we did not like is the fact that it does not have a drain plug. Draining is always easier in a cooler with a drain plug, and the absence of one in this cooler simply means it’s going to be harder than expected. The advertised time, according to DeWalt themselves, is 5 days. Sure enough, we did our own investigations. We couldn’t test the ice retention ourselves this time, but we did research what different users saw, and the consensus is that the cooler can, in fact, achieve 5 days of ice retention. A more realistic and common number, however, is 4 days. But we feel that’s a pretty good figure, given that the cooler is not rotomolded. 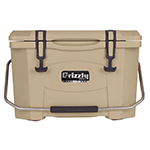 There is only one available size for this cooler, which is the 27-quart option, and only one available color, which is yellow. In this respect, there isn’t much variety. 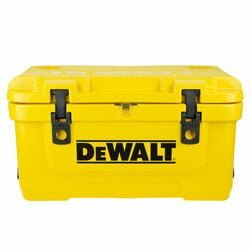 Just like with any other DeWalt product, this cooler comes with a limited lifetime warranty; a testament to DeWalt’s high manufacturing standards and the quality of their products. Generally, we feel like this cooler is worth the money with all the features it offers and the value it brings to the table, especially if you consider the fact that it is not rotomolded. 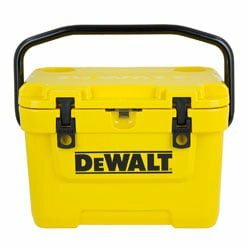 It felt rather gratifying for us to find out that DeWalt also offers a rotomolded cooler. That shows that they have an intimate understanding of the kind of cooler design that makes it in the cooler industry. We’ve heaped praise countless times on the rotomolded design for best-performing coolers and mentioned their superior strength, durability, and insulation capabilities, so you know why it means a lot for us to see that DeWalt have a rotomolded cooler. That is one of our favorite things about this cooler; the fact that it’s rotomolded. It has been built to withstand the toughest environments, keeping ice longer and also surviving drop tests. In a construction environment where you might end up dropping your ice chest from many floors above, we can see why this is a practical advantage. As for the overall look, the cooler certainly looks rugged and like it was made for a hardworking man. It has strong construction, with tough plastic on the outside and thick foam on the inside. The plastic is guaranteed to resist UV rays, water, and dust, which is something you would have to constantly worry about if you were using a regular cooler. Let’s start with the lid. 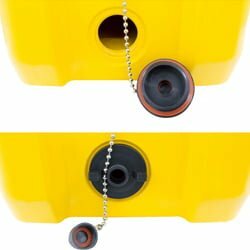 The lid is pretty well designed with an industry-grade gasket underneath for better insulation. You know when you close that lid shut that it is going to insulate the contents of your ice chest very well. But it doesn’t stop there. There are also latches on the lid that help it to hold the cold in even better. These are easy to open but very secure latches that actually strengthen the ability of the cooler to hold in the cold. The hinges at the back are also very strong to ensure the lid stays firmly closed. And yet even that is not enough! Something else we absolutely love about his lid is the utility it offers. On the outside, it is equipped with 2 can holders where you can put your can of coffee or whatever other drink you would rather not put in the cooler. On the inside, the lid has storage space for extra ice packs, which you can buy separately. So it’s not just a lid, but also a storage device! Of course, apart from all of these features, the lid also comes with the standard built-in bottle opener so you don’t have to think too hard about how you’re going to get your bottle of beer opened. The DeWalt cooler also has strong handles on the side. These are heavy duty nylon handles that make it super comfortable to carry the cooler around when you’re transporting it from one spot to another. We’re glad they put the nylon handles on this cooler because they seemed to have forgotten to do so on the rotomolded version and that was a pain point for us. On the inside, we have an accessory rail system for all the extra stuff you want to put in the cooler but don’t want to get wet. The accessory features on this cooler are just out of this world, and sometimes it feels like DeWalt didn’t just build a cooler; they built a utility bag as well. Something else we absolutely love about this cooler is the dual sized drain plug. It is very large; about the size of two normal sized drain plugs, which means draining your melted ice from your cooler is going to be a very easy job. That’s another plus for the good people at DeWalt. Finally, the feet on this cooler are something else worth admiring. They are non-slip feet, which means they have a very good grip. If you’re going to put this cooler in the back of your truck or van, or any other surface that is likely to move around or where the cooler is likely to be jostled around, then you don’t have to worry about it moving too much because of the deadly grip on these feet. The polyurethane insulation inside this cooler is very thick and ensures it retains ice for long periods. Remember that this cooler is rotomolded, which translates to superior insulation. 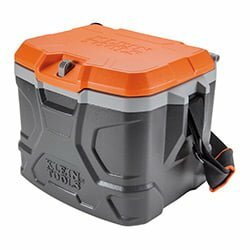 To be sure, it delivers what is expected since its ice retention is much better than the 5 days you get with the Toughsystem compatible DeWalt cooler. Again, we didn’t test it ourselves this time (we plan to follow up soon), but we did some thorough research on reviews of the cooler and found that the consensus was that it can retain ice for a week plus, which is quite respectable for a newcomer. It’s actually on the more or less same level as a Yeti in terms of ice retention! 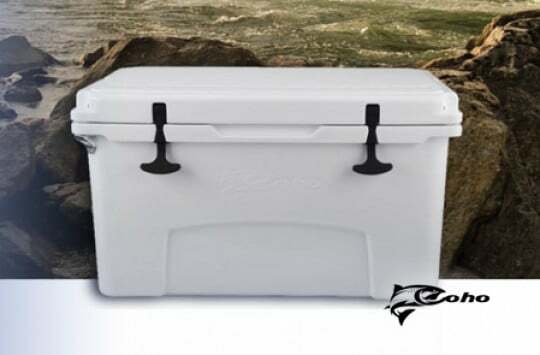 This cooler comes in 4 available sizes: the 10-quart options, the 25-quart option, the 45-quart option, and the 65-quart option. As far as color is concerned it only has the yellow option. Just like with the Toughsystem compatible DeWalt cooler, there is a clear lack of variety. However, we’re going to cut them some slack because they’re only just entering the market. We can only hope that with time, and as their market share grows, they are going to offer more variety in terms of available colors and sizes. Once more, like just about every other quality product from DeWalt, this rotomolded cooler comes with a limited lifetime warranty. We have a strong feeling you’ll probably never have to invoke that warranty. This looks like the kind of cooler that could be your lifelong companion. And now we come to that familiar section of the review where we compare the newcomer to the incumbent. 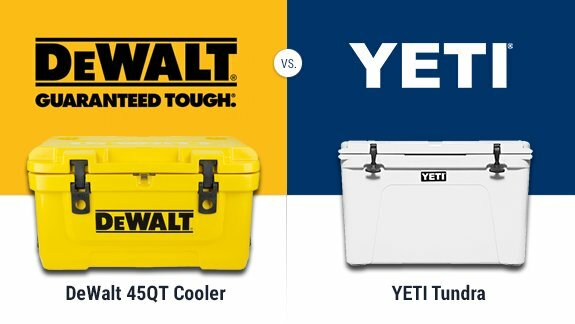 In this case, the comparison is between the DeWalt rotomolded cooler and the Yeti Tundra. There are quite a lot of interesting talking points here. For starters, a glaring difference between these two is variety. The DeWalt only offers 4 available sizes and one available color. The variety in size is fairly good enough that most people will find something that works for them. The lack of color variety, on the other hand, is quite limiting. 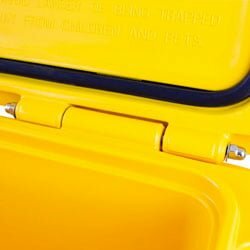 The fact that this cooler only comes in yellow excludes users like hunters, who would probably want something that easily blends into the environment that they operate in. Also, yellow doesn’t seem like a very outdoorsy color. 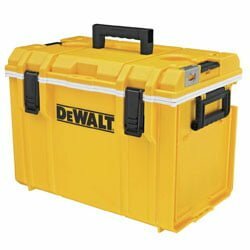 The DeWalt cooler seems to have been made for the working man or for those who want nothing more complicated than a picnic or a tailgater. 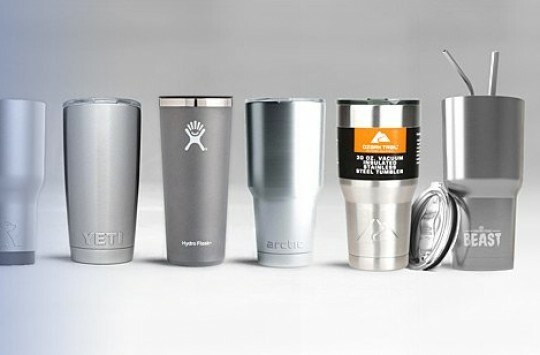 Compare the above to the Yeti, which has a wide variety of colors and sizes to choose from, as well as a robust third-party market for accessories. All the same, it’s pretty difficult to compare these two. In terms of durability and performance, the DeWalt measures up to the standards of the Yeti. When it comes to ruggedness, it may even have a slight edge over the Yeti. As for variety, the Yeti comes out ahead with more options for sizes, colors, and accessories. Part of what makes them difficult to compare is the fact that they seem to be made for different environments and different target markets altogether. The Yeti is meant for active people who love the outdoors, such as hunters, fishers, hikers, campers, and the like. The DeWalt seems to have been made for the construction site and other similar environments. Even so, the DeWalt could work for a camping trip while the Yeti would probably be strong enough to survive a construction zone. What we feel is that they are both good for different purposes and it wouldn’t be a bad idea to have both. To be sure, the DeWalt has a much better price point than the Yeti, making it highly affordable. Also, if you’ve got enough financial muscle to afford a Yeti, you can surely afford an extra ~$130 to buy a DeWalt for work, that is, if you work in a tough kind of environment. Ultimately, if you’re going to choose between the two, we feel it all comes down to individual preference. 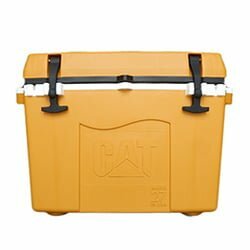 Caterpillar’s CAT Cooler is a great cooler that lives up to the reputation Caterpillar as a brand has. We have reviewed it before and found it rugged, durable, strong, and great on performance. In terms of price, it’s a little pricier than the DeWalt, but still much more affordable than the Yeti. The Stanley brand is well known in the market for making the best vacuum insulated containers. 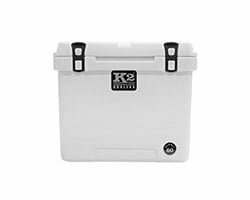 They have a rich century-long history of making nothing but the best products, so when we heard that they have a cooler, we were eager to review it. 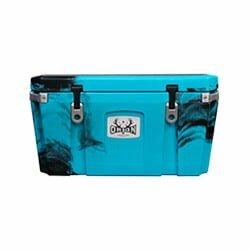 What we found was a stylish and unique cooler that’s definitely worth having! Klein Tools is a direct competitor to DeWalt when it comes to providing workmen with the tools they need to excel at their work. They make a lot of things, ranging from screwdrivers to power tools. They also have a cooler known as the Tradesman Pro Tough Box Cooler, which we reviewed and thoroughly enjoyed. You’re probably wondering where to buy a DeWalt cooler. Well, you can get it on their website, along with lots of other products by the brand. You can also consider buying them on Amazon, which happens to be the one of the most trusted online marketplaces in the world. They offer great advantages, including real reviews by other users who have purchased the products and experienced them, buyer protection for when you’re not satisfied with the product, and one-day shipping or free shipping in some cases. 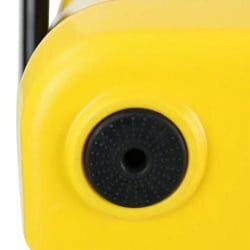 And with that, we end our DeWalt cooler review on a high note. These coolers have surpassed our expectations for both the rotomolded and non-rotomolded versions. We’re proud of how the rotomolded one gives Yeti some healthy competition and can’t wait to see more in the cooler space coming from DeWalt! DeWalt is now officially cool!